Fixed bug introduced in 2.3.6 allowing some unstable experimental instruments to be selected in the band UI. Fixed a text entry mode bug reported by @JMW and @HertzDevil: when a chord is selected, clicking and dragging anywhere else on the chord track moves the currently selected chord to the mouse cursor. Fixed NaN bug with Tempo. Fixed broken vertical scrolling in some Chromium-based browsers. in the Band Editor, click the MIDI clip icon of the track(s) you want to export. drag the downloaded .mid file from your browser of your downloads folder into your DAW. Shareable Project URLS Click File -> “Create a Sharable URL” to create a URL that you can share with people that you want to view and play your project. This URL can be deleted anytime by clicking File -> “View Sharable URL” and following the instructions. Fixed a MIDI export bug causing notes with a volume of zero to be exported with a velocity of one. Added new debug info in midi console. (Possibly) fixed SVG scale/transform bug causing Hookpad to crash while chords or notes are resized by dragging edges with the mouse. Keyboard shortcuts for copy, paste, undo, redo, select all, and new now work with cmd and ctrl modifiers. Improved flow for YouTube Syncing (unreleased). When forking a TheoryTab, “Save” routes to “Save As” which opens a dialog allowing the user the opportunity to name the project before saving. Added state for the id of the root-level div. Poppers now use this state property rather than assuming the root level div has an #id of “root”. Fixed issue that could cause meter changes to misplace bands/key changes/breaks. Changing MIDI menu to enable/disable all MIDI inputs at once. This is to fix an issue where some MIDI instruments were being labeled on incorrect ports. We will add back the ability to individually enable MIDI inputs once this is worked out. Added support for showNoteStaff and showChordStaff settings. Added setting for ignoreBreaks that is wired in in tab mode. Added support for Tab zooming, which works in factors of two. Fixed bug in all browsers except Chrome that would cause Hookpad to not download sound assets. This bug was introduced in 2.1.2 earlier today. Fixed crash when loading Hookpad 1.x projects with a YouTube attached. This is still not supported but it no longer causes Hookpad to crash. The Band Editor can now be toggled in and out of persistent view, making it easier to simultaneously tweak the band and the music. As the cursor moves, the Band Editor us updated to reflect the band at that point in time. Lyrics Editor can now be resized. Audio buffers are now only decoded as-needed in a performance to save memory. Sheet music score export now exports landscape. Midi controller entry for notes no longer picks the wrong note octave in some keys. Sheet music export adds instrument names to staves. Sheet music export now only exports one consolidated melody per lead voice rather than one stave per lead instrument. Acoustic guitar leads now play correctly above G5. Mp3 export now downsamples according to client hardware specification sample rate to fix exports in wrong key/tempo. Mp3 export now properly exports stereo sound. Fixed a bug causing pickup bands to crash during mp3 record. Fixed a bug causing project to bounce mp3 using first band only. Sample rate of project and mp3 encoding are synched which should fix detuning bug on some platforms. Relaxed conditions for non-Hookpad+ band changes so that non-plus users can edit volumes of bands. Configured Hookpad to accept tabs copied from the TheoryTab library. Fixed a bug causing certain old Hookpad projects to crash when loading into the new Hookpad. Fixed a bug causing the old version of Hookpad to not properly load in some cases. More Intuitive Entry and Editing The familiar text-like entry mode is still supported, but a new entry mode allows lets you edit without affecting music ahead of the edit point. Key Changes, Tempo Changes, Meter Changes, and Band Changes Within a Project You can now change the key, tempo, meter, or band as many times as you want within a project. Expanded Library of Sounds And Instruments Hookpad 2 has all of the Hookpad 1 sounds plus 42 guitar presets, 108 drums, 72 leads, and 61 basses. Measure-Level Exporting Hookpad 2 lets you export sections of your song with measure granularity. Chord Bass Collections Hookpad 2 lets you choose from a palette of chords that share a common bass note. Expanded Support for Simple and Compound Meters Hookpad 2 supports standard time signatures for simple and compound meters. Drum, guitar, and harmony instrument rhythms adjust automatically based on the meter. Improved Performance Hookpad 2 is more performant and no longer requires the Adobe Flash Plugin. Hookpad 2 is Backwards Compatible Hookpad 1 projects can be opened, edited, and saved with Hookpad 2. New projects originating from Hookpad 2 cannot be opened by Hookpad 1. Hookpad 1 projects that are opened in Hookpad 2 and saved with Hookpad 2 can still be opened with Hookpad 1, but they won’t contain any	of the changes made with Hookpad 2. Added checks for Hookpad+ in polyphony. Changed non-plus experience for bands: now non-plus users can use any default band template, but can no longer change instruments or add new instruments to a band. Adding default band templates for various styles. Removing Youtube button, as this will not be a part of the initial Hookpad release. Key changes now preserve octaves correctly. Fixed a bug causing borrowed chords from very old HP1 projects to not import properly. Fixed a bug causing drag handlers to not show up in some cases. 13th chords in full voicing mode now play the 5th. Full voicing no longer omits suspensions. Sheet music export works with chords requiring “+” sign. Fixed bug causing chord degree omission voicing no3 and no5 to remove other scale degrees in some cases when using “full” voicing. Midi export now exports drum track in the octave expected by most DAW drum instruments. Add6 chords now properly preserve 7th of chord in 7th chords. Fixed bug causing addX chords to drop chord tones in sheet music export in some cases. Blank state hints now show up correctly if entire first line is empty. Measure staff blank state hint now goes away if there is a measure selection. Fixed bug with special characters (e.g., b for flat) in absolute chord graphics with suspensions. Midi export no longer can create notes with velocities outside of the interval [0, 127]. 13th chords with explicit alterations of 5 now play this degree. Double chord tone accidentals no longer crash, however they display as single accidentals. Notes that cross octave boundaries due to accidentals now display in the correct octave. Compound meter using beat unit of 1 now displays chords in chord mode with correct durations. - Fixed bug where ‘+’ was being dropped from .ly files when transferring to server. Added keyboard shortcuts (enter, escape) for the delete project confirmation modal. Key changes using navigation bar button now spell correct enharmonic based on available key tonics. Added support for two-dimensional melody selection. Added support for renaming saved projects through File -> Open menu. Added split and tie buttons to the duration selector. When split is activated through duration selector or by holding “/”, cursor changes to indicate that clicking will split the chord / note that is clicked. 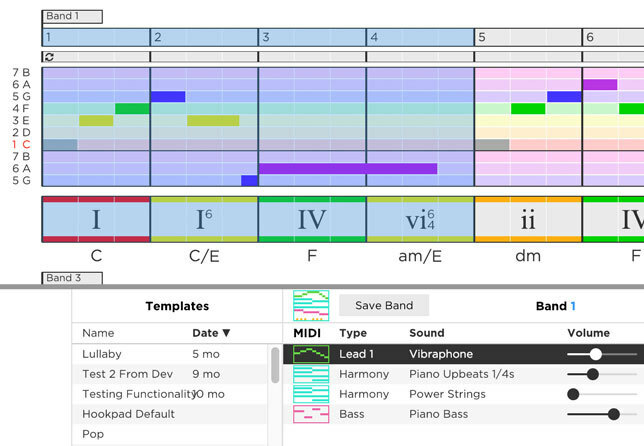 Added support for score, tab, lead sheet export (requires Hookpad+). Added support for mp3 export in next release (requires Hookpad+) Still need to fix worker path bug. Added raise/lower by half step, step, and octave buttons to melody GUI. Added global volume menu with mute buttons for melody, chord, bass and drum tracks. Added “full” voicing, which does not organically omit scale degrees for chords. “Piano Full Chords” Harmony option will include bass, and can be used to export to MIDI to achieve bass note in harmony voicing (MIDI exporet requires Hookpad+). Holding ‘b’ (for both) allows dragging notes up and down and left and right simultaneously. Added support for line breaks. Hitting enter will add a line break at the cursor. Also can add a break from measure selection gui when a measure is selected. Fixed bug causing drum pickup rhythms in swing eights time to crash. Removed erroneous augmented symbol applied to the target of an applied chord. Magic Chord, Magic Bass Chord, Exporting, and Lyrics now require active Hookpad+ membership. Eventually measure export, saving band templates, and certain band sounds will require Hookpad+. Playback can now be “solo”-ed for leads 1-4, harmony, bass, and drums. This applies to mp3 export as well. Fixed bug causing the first note of playback on some instruments to have a late attack. Projects imported from Hookpad 1 containing chords borrowed from “supermodes” now correctly preserve these modes. Seventh chords in 3rd inversion omit the “7” label only for major, minor, diminished, augmented and major minor seventh qualities. Relative transpositions are supported for valid relative scales. added support for polyphonic pasting when copying a measure selection. rests in inactive melodies are hidden. The fifth of sus42 chords now properly gains accidentals when appropriate in borrowed modes. Changing a band, key, or tempo in the middle of playback no longer crops playback of old setting and no longer double-hits drums. Loading projects from Hookpad v1.x no longer causing voice 4 to be loaded at full volume. Fixed an issue causing meter changes from Beat Unit = 3 to Beat Unit = 1 to put the scrubber in the wrong location. When loop region snaps to measures it now respects meter changes. When loop region is inactive it is invisible mouse drags. Fixed custom cursor changes during mouse over inactive regions to match this behavior. fixed issues with shift selecting across notes and chords. pasting won’t overflow a line in classic entry mode. it is not possible to copy paste a key/meter/tempo/band change by clicking on the flag to select it. Fixed issue with clicking notes/chords sometimes not selecting the item (occured only on some platforms with certain input devices). fixed bug with dragging notes on chromatic staff. Band UI is now a menu, consistent with meter, key, and tempo menus. Inversions of altered chords are now properly showing stable scale degrees and coloring. Chords #vii˚/#vii and V/#vii obtained by borrowing major chords in the minor mode no longer freeze Hookpad. This bug is fixed for all combinations of borrowed/applied chords that create double-sharped scale degrees. Descending chromatic transposition via the ‘,’ key now properly displays on the note context GUI in scales that do not contain a leading tone 7. Alterations of the 5th are now playing properly on ninth, eleventh, and thirteenth chords. Inversions of altered chords no longer alter incorrect scale degrees. Dragging notes up / down with expanded note staff now works. Still have a bug with chromatic / option drag with expanded staff.